For reasons still debated among scientists today, Anasazi culture in the Southwest had collapsed by 1300, creating what is known to academics as "The Great Abandonment." According to Navajo oral histories, the Anasazi were dispersed by a whirlwind because they had abandoned the ways of their ancestors. Whatever the causes, the eastern part of the Four Corners region became uninhabited in a flicker of geologic time. Yet the legacy left behind, observed David Ortiz, staff anthropologist for Navajo archaeology at Northern Arizona University in Flagstaff, "is the image of supreme beings, skilled at astrology, peaceful, cooperative and wise." People from all over the world have made much of the Anasazi, a Navajo word for "ancient ones' or, some say, "ancient enemies," believing them to have been deeply spiritual. But what if that peaceful image is wrong? Few ever raised the question. Those who did were rewarded with blank stares, angry letters and canceled meetings. One who persisted was Christy G. Turner II, the regents' professor of anthropology at Arizona State University at Tempe (HCN, 5/24/99). And now, the mainstream panjandrums of Southwestern archaeology and anthropology can no longer ignore him. The Pollyanna image of a peaceful people has been cracked - some say shattered forever. The reason is the publication of Man Corn: Cannibalism and Violence in the Prehistoric American Southwest, by Turner and his late wife, Jacqueline. It is the first detailed account of cannibalism and violence on a regional scale in the prehistoric American Southwest, especially in the Chaco Canyon area. The title of the book comes from the Aztec word tlacatlaolli, a "sacred meal of sacrificed human meat, cooked with corn." The book itself is a prodigiously descriptive 547-page tome, many years in the making and now destined for more printings and a PBS television special. It's a shocker. "The land of the Anasazi was not a pleasant place to be, after all," Turner says. "It was just as violent as any place else in the world. Mean and unhappy." 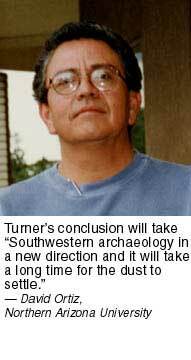 Turner's conclusion, Ortiz predicts, will take "Southwestern archaeology in a new direction and it will take a long time for the dust to settle." Some 20 centuries ago, the Anasazi began to wander into the steep escarpments, open desert and high mesas of northeastern Arizona, northwestern New Mexico, southeastern Utah and southwestern Colorado. There, the culture they arrived with underwent a transformation. Hunters and gatherers became farmers and artists, who made sophisticated basketry, built pueblos the size of the Roman Colosseum and fashioned intricate cliff dwellings, the remnants of which are tourist favorites in parks and canyons in the Four Corners region today. Of all the intriguing Indian cultures in the Southwest, these enigmatic people are the most romanticized. In the prose of tourist brochures, in the verbiage of academic journals, in cyberspace and on videos about life and culture at Chaco Canyon, Mesa Verde, Canyon de Chelly and hundreds of other sites, their civilization is recognized as the great hearth of Southwestern culture. The Anasazi conducted sophisticated trading activities with Mesoamerica, the Hohokam in Arizona's Salt River Valley, the Mogollon in Central Arizona and with the natives in California, exchanging beans, corn and turquoise for parrot feathers and abalone shells. By 1200, the most famous site, Chaco Canyon, had become the center of an economic, ritual and social system spread out over an estimated 100,000 square miles. One hundred years later, it collapsed. Was it drought, famine, enemy raiders? Was it disease? Sudden climate change? Overpopulation? A curtain fell on their Golden Age and the people departed swiftly, in some cases leaving pet birds behind to die on their roosts. They bequeathed a ghost world for future explorers to discover. Despite the romantic aura of the Anasazi, many famous scientists down through the years have suspected them of cannibalism - Fewkes, Hodge, Pepper, the Weatherills, the Listers, Pilles, White and Danson, among others - and Turner presents Man Corn as a tribute to them. "The vast majority saw it correctly," he says, "but their work was never acknowledged in the profession's mainstream because it flew in the face of conventional wisdom." Turner says cannibalism was practiced for almost four centuries, starting around 900. It was most common in the Four Corners area, especially among people living in Chaco Canyon and outlying Chacoan great houses, and it increased dramatically shortly before the Anasazi abandoned their pueblos. This assertion took a long time for Turner and his late wife to construct. Years of research were required under auspices including the Museum of Northern Arizona at Flagstaff and the National Geographic Society, before Turner felt he was on sufficiently firm ground to challenge prevailing thought on the Anasazi. Explains Turner: "Like others in the field, we had to work our way through the conventional wisdom that the people who created the beautiful pottery and architecture could not possibly have done these things. I mean, the ruins are terribly romantic. It is beautiful country, a fantasy world, and that is a great influence on lots of archaeologists. Down through the years, countless people visited the ruins. They came away with everything but the truth." Not for the fainthearted, Man Corn analyzes in excruciating detail 76 Anasazi sites at which Turner says he can confirm that violence or cannibalism occurred: 11 in Arizona, the rest in Utah, Colorado and New Mexico. In the cemetery, among other orderly burials, was uncovered a heap of broken bones belonging to three individuals. It was evident that the shattered bones had been clean when they were placed in the ground, and some fragments showed scorching by fire. The marks of the implements used in cracking the bones were still traceable. Without doubt this ossuary is the record of a cannibal feast, and its discovery is interesting to science as being the first material proof of cannibalism among our North American Indians. The charge of cannibalism raises obvious questions. First, how can scientists distinguish between violence and cannibalism? Turner answers: "It comes directly from bone evidence. Bone damage is able to be classified, inventoried, identified and pigeonholed. It turns out that in factoring out different kinds of damage, cannibalism far exceeds anything that we can refer to as violence. "That is because the key component in violence is simply violent death, torture, mutilation. It stops there. There is none of this breaking up of the people, whole skeletons reduced to little tiny pieces. We can make a powerful inference that all those little pieces have been processed for cooking. "In cases of violence, they didn't go to the next step of sitting down and peeling the people, defleshing them, breaking the bones open for marrow and showing us every sign of cooking - heads roasted, bodies boiled, bones pot-polished." Across the Southwest, voices have risen in angry protest against Turner's thesis. "He has not proven a thing," charges Kurt Dongoske, tribal archaeologist of the Hopi Tribe. "What he has demonstrated is that people were hacked apart, their bones dismembered. He presents no evidence of human ingestion." Dongoske's anger swells as the conversation in Flagstaff continues. "Cannibalism is a pretty terrible thing. Look at the rock art in the Southwest. Don't you think that someone would have depicted the consumption of human flesh in the petroglyphs and pictographs? They depict everything else - Spaniards arriving, clan migration routes, ceremonies. If human flesh had been consumed, it would have been depicted on the rock walls. Turner's work is part of a long legacy to denigrate Indians, to dehumanize them." Over in Santa Fe, Peter Bullock, an anthropologist at the Museum of New Mexico, dismisses Turner's work entirely. "We don't accept it over here. 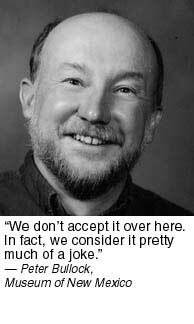 In fact, we consider it pretty much of a joke." To these gibes, Turner responds: "People say, "You cannot prove cannibalism." Basically, this is a misconception about how science works. Science works based on footprints and very powerful inferences. You can only prove something with mathematics." Later in the interview, he muses: "What did I do to catch these people off guard? Why are they so defensive? Why are they so paranoid? What did we uncover?" Warren Cremer, a veteran Southwestern anthropologist based in Arizona's Verde Valley, is persuaded that the controversial book is solid science. "Turner has gathered, examined and presented his evidence with great care and precise measurements. Other scientists can independently test his claims. So far, none of his critics have challenged his methodology." Another scientist who thinks Man Corn should be taken seriously is David R. Wilcox, senior research archaeologist at the Museum of Northern Arizona and sometime colleague of Turner through the years. Sitting in his small office overflowing with books, coffee cups and telephone messages in the museum's research wing, Wilcox explains, "Turner presents a very reasonable scientific argument for cannibalism ... but to say that all Anasazis were cannibals is not the correct inference. It is a vast generalization. It is not as though everybody did it, even if he is right. "But that there were individuals at certain times and places who, for reasons still controversial, may have conducted massacres of multiple people, then butchered and cooked and quite possibly ate them, is very difficult to deny. As for his theories as to why they did it, we don't know." 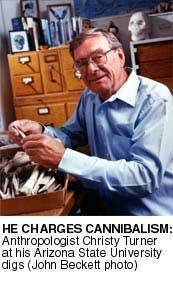 A breakthrough concerning some ancient bones in the Museum of Northern Arizona archives in 1967 led to what Arizona State University paleoanthropologist William Kimbel terms Turner's "legitimate inference" about Anasazi cannibalism. Fascinated by prehistoric bones and teeth, Turner asked a museum curator to let him examine an odd-looking cardboard box resting on a top shelf. The box contained human bone shards excavated three years earlier from a remote site in northern Arizona called Polacca Wash. The bones had been defleshed, cut up and roasted, and they looked, Turner recalls, like "food trash." In 1969, Turner presented his findings of cannibalism, co-written with colleague Nancy Morris. The work was not welcomed, either by his peers or by Native Americans - the Hopi, in particular. Unperturbed, Turner went to work gathering older bone assemblages from many Anasazi sites excavated by his scientific predecessors. He examined more than 15,000 skeletons. Turner experienced an even greater rejection of his research at the 51st Pecos Conference - the World Series of archaeology conferences - at Dolores, Colo., in 1988. According to the program, there was to be a mini-symposium on cannibalism, given the amount of "supposedly cannibalized bone that had been found in recent years." The program was canceled at the last minute because of angry phone calls and threats of disruption. This was the first time a session had ever been canceled, according to Richard Woodbury's 60 Years of Southwestern Archaeology - A History of the Pecos Conference. Ironically, meeting planners had feared sensational accounts in the press. The cancellation, perhaps, drew even wider coverage. Turner never wavered. Just the opposite; his research intensified and came to fruition in 1993, during a long meeting with Wilcox, who'd laboriously created a map displaying the location and distribution of the great pueblos at Chaco Canyon. Turner placed his suspected cannibal sites on Wilcox's layout of the pueblos. "It was a "Eureka!" moment," Turner recalls. "All the research came together. David's map coincided with the location of the cannibalized bone deposits. It was then I knew that the civilization centered in Chaco Canyon was likely the locus of Anasazi cannibalism." The word cannibal, Turner writes, comes from the Carib Indian tribal name, referring to a person who eats human flesh. Though everywhere, cultures have denounced it - cannibalism is bad, and bad people are cannibals' - Turner provides details of the practice going back thousands of years as reported in worldwide folklore, oral traditions, sacred writings, anthropological narratives, war stories, urban police records and tales from lost wanderers about cannibal peoples and cannibal events. "Truth to tell," Turner declares, "cannibalism has occurred everywhere at one time or another." The reasons vary from place to place. They range from starvation cannibalism in the Arctic to cannibalism as a ritual element of social control in Mesoamerica. In China, it was an institutionalized way of showing love and respect. In pre-Columbian Brazil, it was a way for obtaining the power and strength of a sacrificial victim. Finally, cannibalism is associated with social pathology the world over. Turner favors a combination of three reasons for cannibalism among the Anasazi: ritual human sacrifice, social control and abnormal, criminal behavior. But Turner concedes that after many attempts to unlock that mystery, "There is no way at this time to determine who did the eating or who was eaten - friends, relatives, slaves, strangers." He reached that conclusion after searching for similar sites in California, in the Rocky Mountains, on the Great Plains and among the Anasazis' neighbors. It was by the process of elimination that he decided that Southwestern cannibalism "appears to have originated in Mexico, where the practice was common and dates back 2,500 years ..." Turner wrote, "We speculate that this force consisted of cultists and warriors of the Quetzalcoatl - Xipe Totec - Tezcatlipoca deity complex who overwhelmed the local residents, much the way the soldiers led by Cortez fell upon Mexico." "Terrorism is what we are talking about," he says. "Cannibalism was the weapon that forced Chaco Canyon to be built." He rests his case in part on the great wooden beams supporting the roofs of the large pueblos. It is believed that the beams were cut at least 50 miles away. "You don't haul 200,000 beams of wood voluntarily; people were coerced into producing Chaco," Turner theorizes. "The only way you coerce people is through terror and power." Turner also speculates that workers may have been drugged. It is over this assertion that colleagues such as David Wilcox at the Museum of Northern Arizona part company with Turner. "Christy has got a very reasonable scientific argument for cannibalism. However, he is way out on a limb on the Mesoamerican connection." Wilcox agrees that some sort of "organized terrorism occurred in and around Chaco Canyon. But then one runs into the Chinese Box syndrome - lots of meat was being generated. Why? Whatever they were doing was not acceptable in human terms. When Chaco was abandoned, evidence of cannibalism disappears. "Was it evil that caused the Great Abandonment?" Wilcox wonders. The controversies Turner has stirred up may boil for decades. When asked if he thought the publication of his book would discourage tourism in the Four Corners region, Turner smiled. "Too much money is involved in commercial tourism," he says. "Everybody has been in denial about horrors amongst Indians in ancient times. I suspect that, despite Man Corn, that denial will continue. "I am certain that I've found the answer," he concludes. "Let others test it. This is no longer an interesting challenge." Maybe the mystery has been solved for Turner, and maybe the opposition got to him. When told that Turner was leaving the country for a while, Kurt Dongoske said, "Good. The sooner the better." David Ortiz summarizes the frustration. "We will never know for sure whether Turner is correct unless we can find a way to go back in time," he says. "But he is very well respected and I am urging my Indian students at Northern Arizona University to leave concerns of racism aside and look at the facts. "The late Carl Sagan called science 'a candle in the dark.' Turner has lighted a big candle for the rest of us." James Bishop Jr. is an amateur archaeologist and freelance writer in Sedona, Arizona, and the author of the Edward Abbey biography Epitaph for a Desert Anarchist. A version of this story appeared in Phoenix magazine.